Do you want to add a little extra brightness or ... to multiple already edited photos: "Relative adjustment" is your choice. Do you want to apply a preset stronger of softer: "Percentage adjustment" is your choice. Do you want to apply develop changes only on new virtual copies: "Appy to Virtual copy" is your choice. The "Relative adjustment" plug-in can do all and even combine these functions. A little example will explain the need and the solution. Say you developed a bunch of photos. Each photo having it's unique develop adjustments. Now you want to brightens them all a little. Being in the develop module, if you select those photos and move for example the Exposure (or another) slider, all photos get exactly the same Exposure settings. But that's not what you want. You want to add to the current setting of the photo. Jared Platt discussed the problem in this video. Ok, in the Library module you can use the Quick Develop settings, but you have no control how much you add, you only have a few develop tools and you can not use presets. With the Lightroom Relative adjustment plug-in you can apply develop adjustments relative to the current photo settings. So it adds to the photo settings instead of overwriting them. It doesn't matter that the selected photos have completely different settings, all settings are applied relatively to the current one. With this plug-in you can boost the Exposure for example with 0.10 on all selected photos. See section "Why would I use relative adjustments?" for an explanation of the problems of Lightrooms preset system and how this plug-in solves those problems. But there is more, you can also apply a preset absolute like Lightroom does. 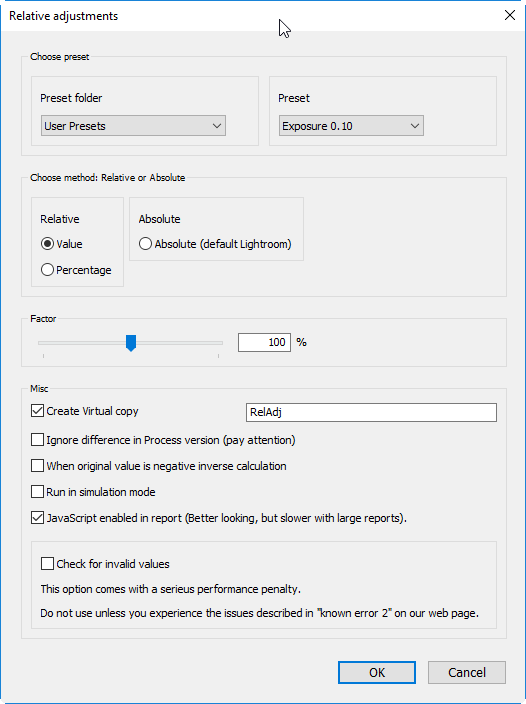 With "Create Virtual copy" setting on, you can create Virtual copy and then apply the develop adjustments. With the factor you can specify how strong/soft you would like the preset have applied.See the Features section below for more info. See the section "How it works below". See the screenshots, because a picture is worth a thousand words. All selected photos get the same develop settings of the preset. For example if the preset contains Exposure = 0.15; all selected photos will have 0.15, despite their current value. All the develop settings will be added/subtracted to the current settings of the photo instead of overwriting them. By changing the percentage the preset can be applied stronger or softer. All develop settings in the preset are recalculated with a percentage. Selecting this option will first create a Virtual Copy and then apply the changes, leaving the original photo untouched. Working with master files this feature allows to apply a preset on a series of photos and get the changes in a virtual copy. All the develop settings will be added/subtracted with the number in the preset. For example add 0.10 Exposure to the selected photos. interprets the values as a percentages to be added to the current photo setting. For example add 10% extra Exposure to the selected photos. This option reports how the photos would be affected by the preset, yet does not apply the preset. By default the plug-in will not process an image when the image has a different Process version than specified in the preset! Checking this option allows you to overrule the default and apply the preset although the Process Version of the preset and the photo are different. Be aware: the when checking this option the Process Version of the photo is not changed! Soft proofing lets you temporarily simulate how an image will appear on another device, such as a printer, by using only a computer monitor. Often you have to make adjustments. The good thing is that there is a logic in the adjustments you make with soft proofing. Soft proof a couple of images and you might see a trend. Now you have a head start if you collect these adjustments in a preset and apply it to all images you want to print with this printer / paper combination. See this real topic in Lightroom forums. The question was: "Is there a way with LR that I could select the 1000 photos and adjust the white balance temp by -300K and the tint by -5?". Yes, no you can with this Relative adjustement plug-in. Another question on the forum: "How to apply presets RELATIVE to you pictures? (exposure)". Use the plug-in, choose apply the preset "absolute" as Lightroom default does, and experiment with a lower factor. Create Virtual copy and apply preset in one action. The plug-in will create a Virtual copy first and then apply the preset. Create a master photo and apply preset for special derivative photos. Default when you apply a preset on your master photos, there is a great change that it unwillingly overwrite settings of the master. With relative adjustments you can create a master photo and then create and apply presets that take the settings of the master as a start. First, this plug-in works with Lightroom presets. A preset can contain one or a group of settings. For the plug-in it does not matter. This is the power of the plug-in that you can apply presets relative, absolute and with a factor. Direct or on Virtual copy. Select the "Apply mode": relative or absolute. Creating a preset yourself is very ease, see the resource section below. The nice thing about presets is that you can group the desired develop settings in one preset and use them again and again. Develop settings that have a range of -100 to +100 or more, you can set the percentage as the value. For example Shadows 50%, you create a preset with Shadows with the value of 50, see example below. Some settings like Exposure have a smaller range. Exposure can be adjusted from -5 to +5. In this case you set the percentage as decimal value. For example for Exposure 50% you create a preset with Exposure set to the value of 0.50. Why should I use relative adjustments? The need for relative adjustment can best be illustrated by the drawbacks of the default "absolute adjustments". The main problem with preset is that they do not take in account the current develop settings, but just overwrite them. As you know every photo is unique. Some come out of the camera a little over exposed, others under exposed. That counts for all settings. If you have adjusted the individual photos for these settings, after the application of the preset, or an individual setting, all the photos have the same value for the setting(s). Applying the same "Lightroom Aged photo" preset relative would mean that all photos would have a -15 substracted of the Blacks value and for all other settings the photo would be unchanged, because these have the value of zero. Choose the preset folder and the preset from it. This is the preset that will be applied. You can apply a preset either relative or absolute. With relative the settings within in the preset will be added to the current value of the photo. This can either be as a value or as a percentage. When choosing absolute, the preset will be applied as is, so overwriting the current value of the photo. This is how Lightroom also works. The value in the preset is multiplied by the factor. 100% means multiplication with 1.0, 50% means multiplication with 0.5. If the preset contains Exposure 0.50 and the factor is 50%, the values applied will be 0.5 * 0.5 = 0.25. Combined with the method, this 0.25 can either be added or written directly. When checked, the plugin will first create a virtual copy of the photos selected and then apply the preset to this virtual copy. This is a great way to either test the results or when you would like the original photo also. The default behavior of the plugin is to add the preset value. 1.0 + -0.2 = 0.8 and -1.0 + -0.2 = -1.2. Checking this option will subtract instead of add the preset value, when the value of the photo is negative. So 1.0 + -0.2 = 0.8 and -1.0 - -0.2 = -0.8. 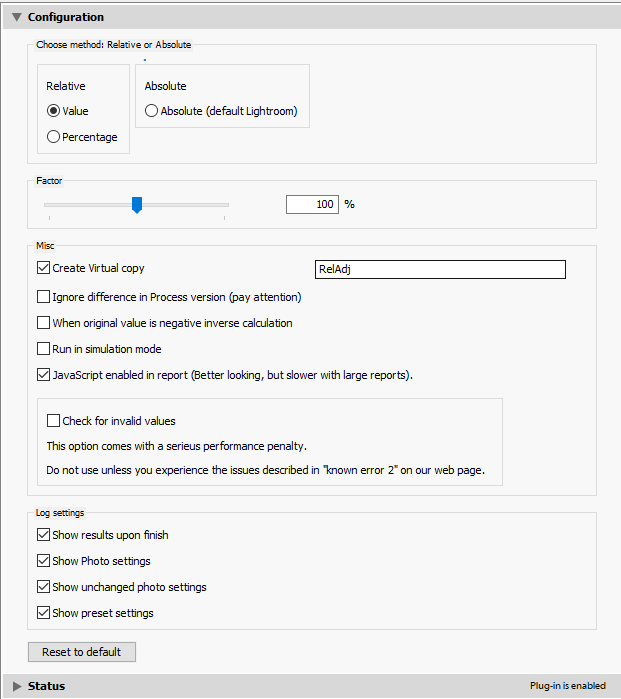 With this option checked the plugin will calculate and report the changes it would make without applying them to any photo. When set, the plugin will open the report in the browser after it finishes. When checked, the report will contain for each photo the before and after settings value. Otherwise this information is not reported. When checked, all the settings of the preset will be listed on each photo. Also if the values before and after the preset are the same. When checked, the preset contents are listed in the report. You can find the configuration panel via the Plug-in manger (menu File -> Plug-in manager) and choose the Relative adjustments plug-in and open the "Configuration" tab. See the Quick guide for explanation of these options. For an explanation of the option, see above. By nature not all develop settings can be applied relative. All local adjustments tools like Crop Overlay, Red Eye Correction, Spot Removal, Graduated Filter and Adjustment Brush. All settings like Camera profile etc. The Lightroom plug-in API has a bug. This makes that the behavior of the "Create Virtual copy" function in some views does not work correct. (Library-Grid, Library-Loupe and Develop). I tested it on 3 different machines, both Mac OS X and Windows, and on each machine the function failed, yet the situation being different. And on all machines it runs in at least one view well. The bug is: when multiple photos are selected and Virtual copies should be made that in some views (Library-Grid, Library-Loupe and Develop) only 1 virtual copy is created and not for all. This bug has been reported. To help you determine in which views the "create virtual copy" functionality runs fine an extra test program is added, see "Test Virtual copy" in the plug-in menu. Select between 2 and 10 photos and run the test in all the three views"Library-Loupe, Library Grid and Develop module. Determine in which situation the virtual copies are created correctly. Please run the plug-in in the view that works fine for you. 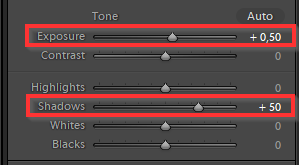 When applying Auto-tone the Lightroom API (Application programming interface) will not always report the correct values directly for the sliders in the Basic panel, like Exposure, Contrast, Highlight, Shadows etc. It might wait until it has generated all its previews. In that case reports a value of -999999 when you run this plug-in before it has finished. This report has been filed with Adobe. In the meantime a workaround is implemented in the plug-in: the option "Check for invalid values". Default this option is turned off, however when you experience that a photo is not altered and in the log you find the values -999999, then you should turn in that case this option on. By default 50% is written as 50 in the preset. You can set the slider on 50 and create a preset. Almost all sliders have a range from -100 to 100, so creating a preset with 50 is easy. HOWEVER for Exposure there is a problem. The range of the Exposure slider is from -5 till 5. If you want to create a preset for 50% you can't set the slider to 50. Until Lightroom 7.3 one could for example set the percentage for Exposure to 50 by editing the preset file, although the range of the setting in the tool is from -5 till 5. However with the transition to the XML versions of the presets, the Adobe Lightroom API (Application Programming Interface) ignores values outside the range between the minimum and maximum value. So for Exposure when you want to apply 50% you have to write 50% as 0.5. So set the slider to 0.5 and save it as a preset. Let's take the Lightroom "General - Punch" preset as an example. We have three photos, each already develop and have their individual adjustments, see column "Setting" and "Current value". What would happen it we applied the Lightroom "General - Punch" on these three photos? "General - Punch" has: Clarity=30, Vibrance=25. *Settings values will be rounded by Lightroom automatically. When you apply a preset absolute (default Lightroom) of several photos, they will all have in the end the same settings. Lightroom applies them "absolute". Applying preset absolute (default Lightroom) will disregard the current settings. Like photo 2, looking good with Clarity -20 will at the end have +30, an increase of 50, while photo 1 only increased +18. Probably photo 2 has much to much Clarity. Soft-proofing is the capability to preview in how onscreen photos appear when printed, and optimize them for a particular output device. Soft-proofing in the Lightroom lets you evaluate how images appear when printed, and adjust them so that you can reduce surprising tone and color shifts. Source Lightroom help.